Maintaining clean, fresh-looking, and hygienic shower and tub areas can greatly enhance the beauty, comfort, and value of your home. The grout cleaning and tile and grout repair experts at The Grout Medic are often asked how to keep shower grout clean and healthy – free of potentially harmful fungus and microbes – and sparkling clean. Regular cleaning of your porous shower grout is essential, as soap, dirt and grime tend to sink deeply into grout lines, which results in unsightly darkening and staining. Over time, the damp shower environment creates a haven for mold and mildew to flourish. Some mold types are visible and exhibit a greenish- black growth while other mold types are not visibly detected. Mold may not only ruin the appearance of your shower or bathtub area, it is also a health hazard. Mold spores from your shower and bathtub area can release additional spores that cause allergic reactions and respiratory ailments. So, what can be done to restore shower grout to spotless white condition and health? Fortunately, effective shower grout cleaning doesn’t always require harsh, abrasive chemicals. With a little elbow grease, minor stains and build-up can be removed safely and at very little cost. 1. 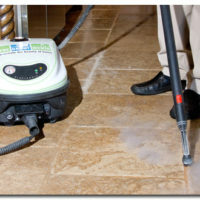 To prevent staining, try periodically cleaning your tile and grout with gentle cleaning agents. Baking soda or vinegar applied lightly and gently may be used for general maintenance cleaning. 2. To prevent mold and mildew, control dampness in your shower and bathroom with fans and dehumidifiers. 3. Never install carpeting in bathrooms. 4. Be wary of commercial cleaning products in enclosed spaces. Never mix chlorine or bleach solutions with other cleaning solutions or detergents containing ammonia as toxic fumes can be formed. 5. Utilize rubber gloves and proper respiratory masks if you suspect any mold to be present. 6. After proper cleaning, specialty sealers can protect tile and grout from soap build up and staining. Certain deeply entrenched stains, dirt, or mold and mildew growth may be impossible to remove using do-it-yourself, eco-friendly methods. In such cases, entrust you shower grout care to the experts at the Grout Medic for a clean and hygienic shower and bathroom. Don’t ignore or be satisfied with that dingy grid of once-white stained grout — keep your bathroom area looking beautiful by contacting your local Grout Medic for a shower and bathroom grout cleaning or tile and grout repair consultation today.